In the first eleven verses of the book of Acts, our Lord outlined a strategy to change the world. Significantly, it starts right in your living room. Today, Ron Moore begins a look at that strategy and your role in demonstrating “resurrection faith” to a watching world. During this month long journey you’ll learn how living in awe of God, submitting to His will and resting in daily dependence on Him can make prayer engaging and effective. 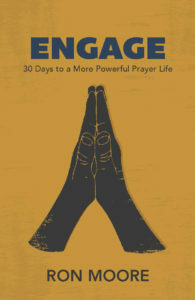 “Engage: 30 Days to a More Powerful Prayer Life” is yours for a gift of any amount.